In the Joint Communique on the Establishment of Diplomatic Relations on January 1, 1979, issued by the Government of the United States of America and the People's Republic of China, the United States of America recognized the Government of the People's Republic of China as the sole legal Government of China, and it acknowledged the Chinese position that there is but one China and Taiwan is part of China. Within that context, the two sides agreed that the people of the United States would continue to maintain cultural, commercial, and other unofficial relations with the people of Taiwan. 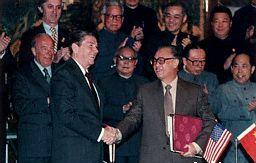 On this basis, relations between the United States and China were normalized. The question of United States arms sales to Taiwan was not settled in the course of negotiations between the two countries on establishing diplomatic relations. The two sides held differing positions, and the Chinese side stated that it would raise the issue again following normalization. Recognizing that this issue would seriously hamper the development of United States - China relations, they have held further discussions on it, during and since the meetings between President Ronald Reagan and Premier Zhao Ziyang and between Secretary of State Alexander M. Haig, Jr. and Vice Premier and Foreign Minister Huang Hua in October 1981. Respect for each other's sovereignty and territorial integrity and non-interference in each other's internal affairs constitute the fundamental principles guiding United States China relations. These principles were confirmed in the Shanghai Communique of February 28, 1972 and reaffirmed in the Joint Communique on the Establishment Of Diplomatic Relations which came into effect on January 1, 1979. Both sides emphatically state that these principles continue to govern all aspects of their relations. The Chinese Government reiterates that the question of Taiwan is China's internal affair. The Message to Compatriots in Taiwan issued by China on January 1, 1979 promulgated a fundamental policy of striving for peaceful reunification of the motherland. The Nine-Point Proposal put forward by China on September 30, 1981 represented a further major effort under this fundamental policy to strive for a peaceful solution to the Taiwan question. The United States Government attaches great importance to its relations with China, and reiterates that it has no intention of infringing on Chinese sovereignty and territorial integrity, or interfering in China's internal affairs, or pursuing a policy of "two Chinas" or "one China, one Taiwan." The United States Government understands and appreciates the Chinese policy of striving for a peaceful resolution of the Taiwan question as indicated in China's Message to Compatriots in Taiwan issued on January 1, 1979 and the Nine-Point Proposal put forward by China on September 30, 1981. The new situation which has emerged with regard to the Taiwan question also provides favorable conditions for the settlement of United States - China differences over United States arms sales to Taiwan. Having in mind the foregoing statements of both sides, the United States Government states that it does not seek to carry out a long-term policy of arms sales to Taiwan, that its arms sales to Taiwan will not exceed, either in qualitative or in quantitative terms, the level of those supplied in recent years since the establishment of diplomatic relations between the United States and China, and that it intends gradually to reduce its sale of arms to Taiwan, leading, over a period of time, to a final resolution. In so stating, the United States acknowledges China's consistent position regarding the thorough settlement of this issue. In order to bring about, over a period of time, a final settlement of the question of United States arms sales to Taiwan, which is an issue rooted in history, the two Governments will make every effort to adopt measures and create conditions conducive to the thorough settlement of this issue. The development of United States - China relations is not only in the interests of the two peoples but also conducive to peace and stability in the world. The two sides are determined, on the principle of equality and mutual benefit, to strengthen their ties in the economic, cultural, educational, scientific, technological and other fields and make strong, joint efforts for the continued development of relations between the Governments and peoples of the United States and China. In order to bring about the healthy development of United States - China relations, maintain world peace and oppose aggression and expansion, the two Governments reaffirm the principles agreed on by the two sides in the Shanghai Communique and the Joint Communique on the Establishment of Diplomatic Relations. The two sides will maintain contact and hold appropriate consultations on bilateral and international issues of common interest.